Ce chalet comprend une position unique d'un rez de chaussée sur deux niveaux qui comprend une cuisine équipée avec bar. Le salon bien présenté est atteint à partir d'un couloir interne, qui est hors la salle de bain en bas, qui a une douche électrique sur un bain de taille généreuse. La salle de soleil / salle à manger est située par des portes françaises du salon, tous ayant des sièges confortables pour se détendre. A l'étage, 2 chambres, 1 double et 1 simple, un petit boîtier de sèche-linge de la chaudière est également à cet étage. Une nouvelle cuisine équipée est à côté du nouveau hall d'entrée à gauche et à droite est l'accès à une nouvelle chambre double en bas avec salle de bains. Toutes les chambres de ce charmant chalet offrent une vue magnifique sur la mer et est un endroit fantastique pour soit des vacances de plage et / ou une base pour explorer la côte fabuleuse Pembrokeshire et toutes ses nombreuses attractions. Pendine bénéficie d'une magnifique plage de 7 mile et est mondialement célèbre pour vitesse sur terre tentatives de record, un musée dans le village est dédié à son célèbre histoire. Le canton de Laugharne célèbre pour sa connexion à Dylan Thomas et son Boathouse est à seulement 4 miles. La propriété est détaché avec un parking privé pour 2 véhicules. Parc à thème Oakwood est environ 12 miles de distance et est le plus grand au pays de Galles. We (family of 5) had a lovely long weekend here. The property has everything you can possibly need, including little things like dishwasher tablets, toilet rolls, tea/coffee... and we also had milk, bread and wine waiting for us on arrival ;) It was spotless, very homely with cosy living room and lots of books / dvds. 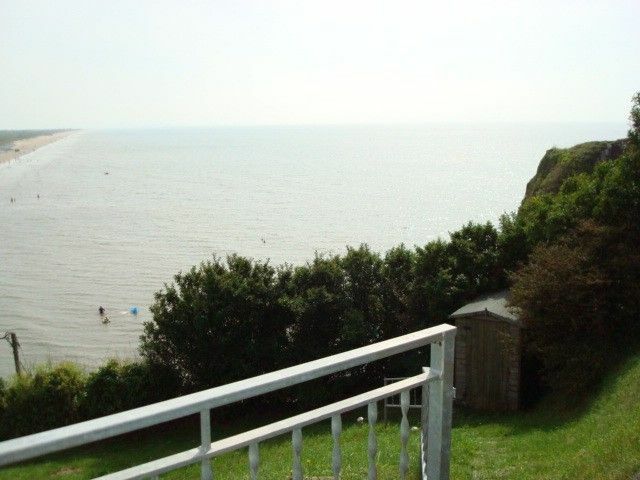 Lovely well equipped cottage in a beautiful location. We're a family of 4 (2 adults and boys aged 17 and 12) and found this cottage absolutely perfect for us. The cottage perches above Pendine Sands, a lot of which is static caravans, but because of its height above the beach feels quite separate. There are a couple of shops selling all the basics and a lot of souvenir/beach accessory shops. The beach, about 2 minutes' very steep walk from the cottage, is lovely a gently sloping beach which means the tide goes out a very long way when it goes but also means the water is pretty shallow for little ones while still being deep enough to enjoy. There are rocks for rock pooling and some interesting caves (take a torch!). The cottage itself has been revamped in the past couple of years, with the addition of a sun room at one end and creation of a lovely downstairs bedroom with ensuite (one of my few criticisms is that this door doesn't close properly! ), complete with really good, powerful shower. There are no proper curtains in this room, just thin blinds, which I found an issue as I'm a light sleeper so was awake at 4.30 every morning, but an eye mask (or better sleeping) would mean this wasn't a problem. There's a good-sized entrance hall with plenty of space for storing beach stuff and a kitchen which also looks as if it's been done up recently. It's excellent - better than ours at home in fact! There's a double oven, good fridge freezer and also nice touches like a coffee press and every kitchen knife and accessory you'd need as well as a good range of pans and plenty of crockery. As we actually self cater this is always welcome to find. Through the kitchen are stairs leading up to the two upstairs bedrooms - double room has great views over the beach, twin room is long and narrow with sloping ceiling. Also from the kitchen are steps leading down to the house bathroom and the living room (cosy) and sun room with lovey views out (even when it's raining). The cottage is really thoughtfully equipped with a good range of games for the wet days and a selection of books (and umbrellas and torches!). We didn't really venture far as we were pretty lucky with weather: walked round the cliffs to Amroth Castle ((not an actual castle) VERY up and down and over 10 miles in total but gorgeous views at points), visited Tenby (very busy, gorgeous icecream from The Stowaway in the Harbour, gorgeous fudge from Roly's) a couple of times and Pembroke Castle (great guided tour). Loved it all. Ein gemütliches Landhaus, direkt an einem ganz flachen Sandstrand. Durch den Garten ist man direkt am Strand. Man kann von der Terrasse aus dem Meer zusehen. Das Haus ist gut ausgestattet. Man fühlt sich gleich wohl. Es fehlt nur ein Liegestuhl auf der Terrasse. Jederzeit wieder. War sehr erholsam. Vielen Dank an die Vermieter, lief alles problemlos! Loved the cottage and excellent views. Family were thrilled to bits. Golf: Hérons Brook, Narberth salaire et de jouer 11 milles de cours de 18 trous. Ski: Ski Pembrey sec pente 32 miles.